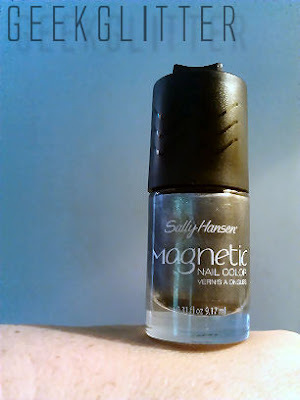 I was given the opportunity to try the Sally Hansen Magnetic Nail Color for free. It came inside my Influenster Summer Beauty VoxBox 2012. I was not paid for this review. The following is my honest opinion based on my own experience from using this product. 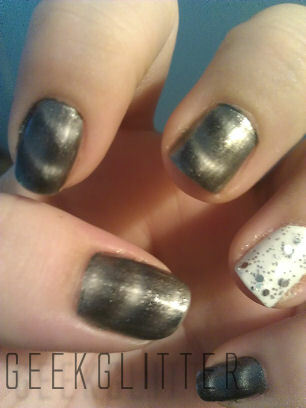 I think the idea behind the whole magnetic nail polish craze is pretty cool. It's neat to play around with this stuff. I was pretty happy that I received the color Silver Elements. It comes is several other colors, but the silver is most appealing to me. I have used this a few times already and I know it will become a staple in my nail painting. It is super easy to apply. Just like normal nail polish, you apply one thin coat and let it completely dry. Then you go back and, one finger at a time, apply a thick coat. Immediately place the magnet (which is found on top of the lid) over your nail for 10 seconds. I found that it helps to kind of roll it side to side. This way the design isn't just in the middle of your nail, but all over. It's a little tricky at first to do this without touching your nail and messing up the color. It didn't take long to get the hang of it tho. It's a nice, thick polish. It goes on really smooth. No clumping, or brush strokes. 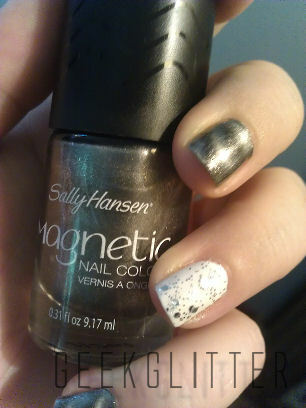 I am totally impressed with this product Sally Hansen! I do think that $10 is a little steep for nail color but given how this stands out from normal polish, I'd say it's worth it. I can see myself using this all the time. I especially like the idea of making this your accent nail design. 4 clean, simple colored nails and then 1 really snazzy nail. The ideas are endless!